Moving overseas has a profound effect on a woman’s identity when she moves overseas to support her husband’s career; change ripples through every aspect of her being. A wide range of feelings are normal to experience to some degree during transition, including feelings of depression. In An Inconvenient Posting, Laura J. Stephens courageously shines the light on her illusion that “everything was okay” when she was spiraling downward into a clinical depression; powerfully exposing an often dark, isolating, and lonely side of an international relocation for the accompanying spouse. The author shares with the reader the early warning signs that gnawed at her; feelings of detachment, loneliness, isolation, despair, anger, loss, and resentment; and how she dutifully pushed these feelings aside to focus on the more positive aspects of the move to support her husband’s career and to give her family the often much sought after opportunity to experience another culture. Stephen’s story chronicles the desolation she felt and how she reached a pivotal turning point, unable to contain her pain any longer; she reached out to get the help she needed. 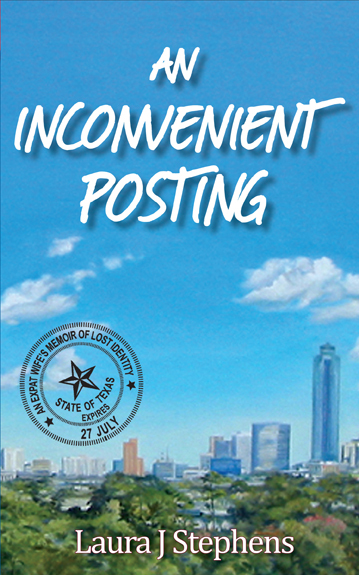 With the guidance of a trusted therapist, Stephen’s learns how the onset of her depressive episode was triggered by her experience relocating internationally as her identity was flung into a state of transition; beginning from the time she and her husband first learned of the possibility of moving from her hometown in England to the wilds of Houston, Texas in the United States. Essential to Stephen’s recovery was her willingness to look inward and acknowledge she was in trouble; her commitment to finding the supports she needed, and her tenacity to move forward and resolve her depression. Emerging stronger within herself in a foreign land, Stephen’s story, along with an array of resources, gives hope to anyone struggling with clinical depression during an international relocation.